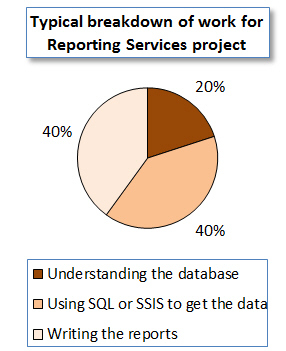 Local council London SQL procedures and SSS reports to produce management information. Telecoms software Slough Design of reports showing switchboard calls. Leisure company Lake District Creation of management reports. Typically it takes as long to massage the data into the right format as it does to create the reports themselves. As an alternative to providing expensive training for your staff, you could consider subcontracting work to Wise Owl instead. With a whole series of SSRS video tutorials online and introductory and advanced SSRS classroom training courses, we can also pass on what we've done before delivering any project. If this sounds of interest, send us some examples of the reports you're trying to produce, and we'll reply with a proposal.